by applying animation effects with simple clicks in Animiz. 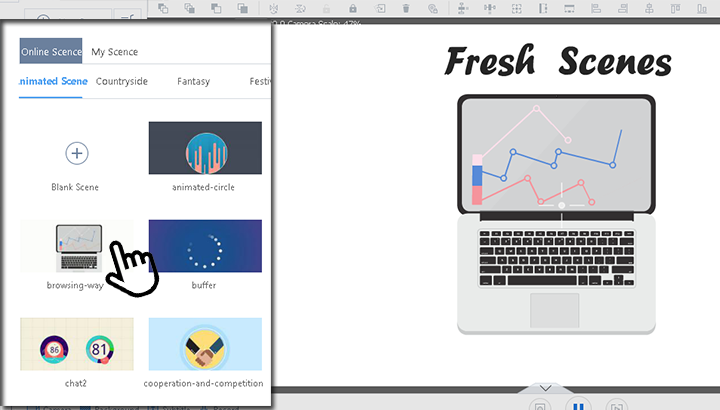 Animiz brings fresh scenes to help you create an animated video presentation quickly. There are a lot of ready-made scenes with different styles, ranging from countryside theme to festival theme. All these themes have a professional look that will attract audience. Choose scenes that you think work best for your subject and click to add these themes to the project to get your job done as quickly as possible. How can you make an Animiz project customized to your brand colors? The powerful color picker solves this problem. 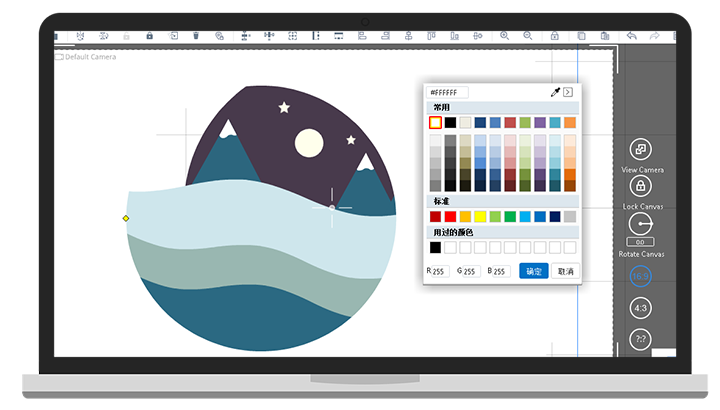 This tool consists of a beautiful palette and an easy-to-use eye dropper, making it easy for you to set a custom color for elements in the project to fit your brand. Play around with the palette to choose the exact hue you need. Or use the eyedropper to grab any color from somewhere in Animiz. 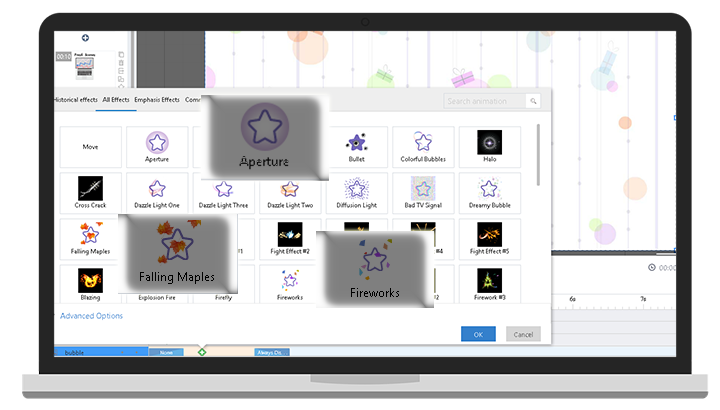 Animiz offers a wide range of animation effects for you to apply to elements, which can bring elements to life. Depending on entrance and exit animations you choose for the objects, you can have a precise control over the way that objects appear and disappear. What’s more, Animiz enables you to customize some animation effects, so that you can add personal touch to the video presentation. 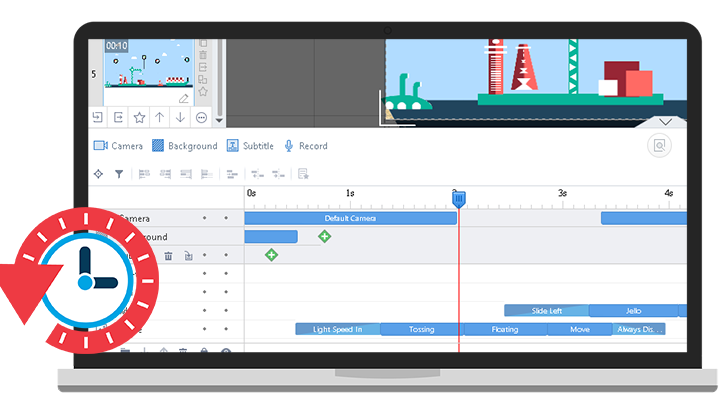 Take advantage of the timeline to edit and control the timing and sequencing of animations applied to objects in your Animiz project. It is easy for you to set the start time, duration, and end time of entrance animations, exit animations and emphasis animations in this cartoon creator software. The timeline is also where you can synchronize the appearance and animations of all objects easily.